Apo-Prednisone (Prednisone) is an orally administered glucocorticoid. Its mechanism of action is altering the immune system response so as to control inflammation. 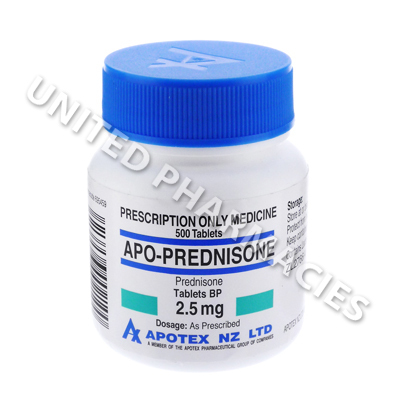 Apo-Prednisone (Prednisone) is an orally administered glucocorticoid. Its mechanism of action is altering the immune system response so as to control inflammation. Anti-allergic effects are also exhibited, and it can even function as an anti-rheumatic agent. Treatment of an extremely broad range of conditions is possible, and it has proven popular in the treatment of rheumatoid arthritis, an autoimmune disorder in which affects the joints, causing stiffness, painful swelling and movement problems. Systemic lupus erythematosus is often widely treated with this medicine. Other uses include asthma, emphysema, emphysema, allergic reactions affecting the skin, disorders affecting the blood (such as auto-immune haemolytic anaemia), hepatic problems, nephritis syndrome, eczema and ulcerative colitis. It has even been used to prevent organ rejection after a transplant. Apo-Prednisone (Prednisone) tablets each contain 2.5mg of the active ingredient. The correct dosage for each patient can vary considerably, and it is important to emphasize that the required dosage will be decided by the doctor, based on the disease requiring treatment and the patient's response. Usually, the starting dosage will range from 5mg to 60mg per day, with less severe conditions normally requiring a lower dosage. From time to time, the doctor may adjust the dosage so as to ensure the best results. When a satisfactory response occurs, further changes to the dosage schedule may be made so as to find the maintenance dosage. Should treatment need to be stopped, the doctor may recommend gradual withdrawal instead of abrupt cessation. Make sure that you report all reactions that occur to your doctor. You will need emergency medical treatment if you suffer from visual disturbances, soreness or tearing of the eyes, seizures, pancreatitis, severely high blood pressure or any other serious side effects that have not been listed here. This medication could reduce the immune system functioning, which could put you at a higher than normal risk of infection. You may be provided with an ID card or medical alert bracelet containing information relating to the fact that corticosteroid medication is currently being taken.